The Re-Enrolled Student Project (RSP) is a collaboration between The Alternative Schools Network (ASN) and the Illinois Community College Board (ICCB). RSP provides expanded academic and wraparound services to over 450 out-of-school teens annually through programs centered in community-based alternative high schools across Chicago. RSP focuses on getting students re-enrolled and supporting them in every way possible as they attain their high school diploma and continue their studies at a college level or place into a job. 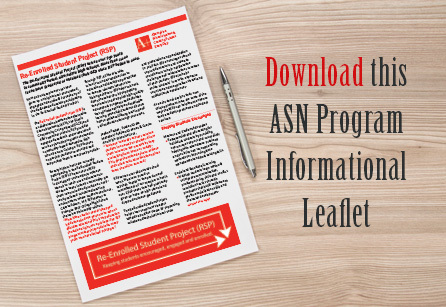 The RSP project is designed to be a partnership between ASN and ICCB, together with its member schools, working with the collective mission of keeping students encouraged, engaged and enrolled.